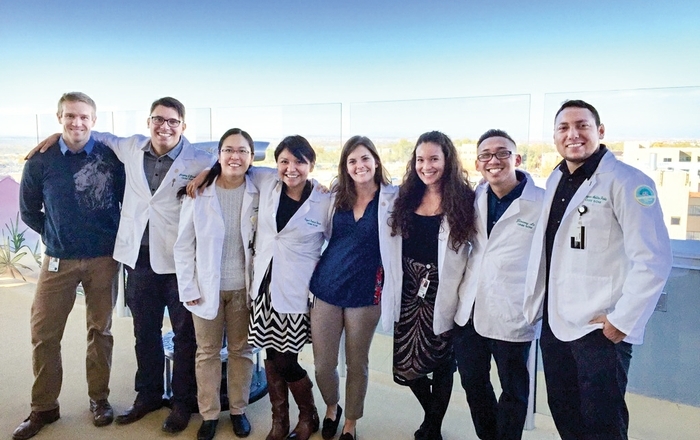 Medical students find a new home in "Learning Communities"
The first year of medical school can be a disorienting experience as students tackle their first hands-on patient care while being force-fed massive amounts of information. They often don’t know where to turn for help in dealing with their stress and confusion, says Sheila Hickey, MD, the UNM School of Medicine’s associate dean of students. That insight led to the introduction last summer of its new Learning Communities program. “We’re hoping we can have some positive impact,” Hickey says of the program, which assigns new students to small groups that are paired with faculty mentor-advisors for their entire four years of medical school. It’s part of a growing trend; about 40 percent of U.S. medical schools already have learning communities in place. Last summer’s entering class of 103 students was divided into four academies (named “Time,” “Life,” “Earth” and “Seasons”), each of which consists of four houses of six to eight students. Members of each house meet once a month, and individual students have one-on-one meetings with their faculty mentors twice each semester, Hickey says. In addition, the 16 faculty members taking part in the program meet every Tuesday to share their ideas and experiences. Participating faculty members are released a half day each week from their own classrooms to make time for their mentoring duties, Hickey says. That eventually will rise to a full day each week, she adds. Each house will gain new members from the next entering class, Hickey says, and in time there should develop a process of “vertical mentoring,” in which students from the upper classes share their experience with newcomers. In addition to their own mentoring duties, faculty heads of houses will also serve as preceptors for the first-year students in their first-semester Foundations of Clinical Practice course. This is where they will practice taking patient histories, study effective communication skills, master the use of stethoscopes and learn how to conduct a physical exam, Hickey says. Michelle Bardack, MD, an associate professor in the Department of Family and Community Medicine, agreed to become both an academy head and family mentor after joining in a lengthy planning process. In 2012 she attended a national conference of learning community programs that was held in San Francisco. 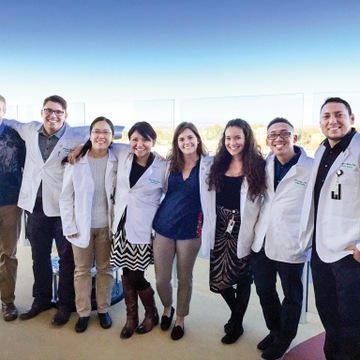 The push to create a UNM learning community was driven by three needs: to improve student advisement, provide additional resources for student wellness and well-being, and find new ways to train students in basic clinical skills. Bardack enjoys the weekly faculty meeting because it offers a chance to share experiences and discuss how best to serve the students. “We now have a learning community of faculty,” she says. “They feel less isolated and more part of a team. They feel they have some friends at the university."